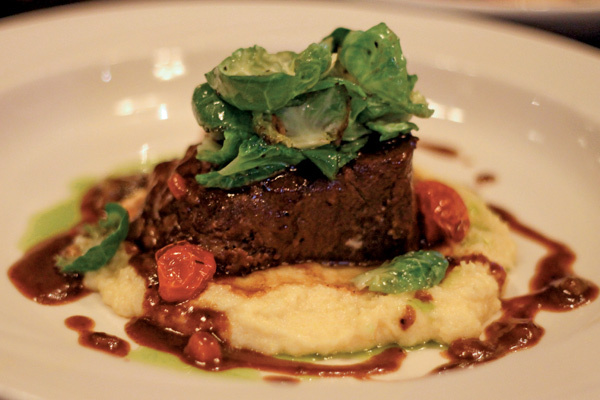 Published: Wed, September 24, 2014 @ 12:00 a.m.
Braised Short Ribs is served as the signature dish at Leo’s Ristorante. Hours: Monday through Thursday, 11 a.m. to 10 p.m.; Friday, 11 a.m. to 11 p.m.; Saturday, 4 to 11 p.m.; and Sunday, special events. At Leo's the food is consistently good. We meet up at Leo’s Ristorante in Howland. Mark, oblivious to sartorial standards, showed up in white seersucker pants, apparently clinging to summer just a bit longer. It’s been 4 months since we’ve sampled any Italian food, quite a feat here in the Mahoning Valley. Leo’s opened in the spring of 1982 and moved to its current location in 1990. It is a family business, run by executive chef/owner Leo Delgarbino with the assistance of his first cousin and executive chef Michael Strollo, both of whom are graduates of the Culinary Institute of America. As is often the case on our monthly dinners, we simply say, “We’ll eat whatever you want, but please give us a few minutes to talk at the end.” With that, the plates start to appear. A trio of appetizers begin our meal: sweet & spicy calamari, steamed mussels in white wine and baked goat cheese with a tomato confit. The calamari rings are lightly floured then deep fried to give a crisp texture yet still keeping the meat tender. These are served with fresh basil, shaved carrot and a Thai lime mustard sauce, providing a nice contrast between the sweetness from the basil and slight heat from the sauce. The mussels were steamed in white wine and finished with an herbed compound butter. The mussels were petite and tender. When the natural juices from the mussels mixed with the wine and butter, it created a sauce that was just too flavorful to leave in the bowl; a few pieces of crusty bread served to soak up the remnants before the plate was cleared. The remaining appetizer was goat cheese surrounded by roasted garlic and a tomato confit, then baked off in a pizza oven. The creamy goat cheese was sourced locally from Mackenzie Farms in Hiram. Served with crostini, the textures and taste of this dish were outstanding. What best to follow a trio of appetizers? A trio of entrees of course. The first was the standout for us — a signature fall dish of Braised Beef Short Ribs. The short ribs are cooked for six hours slow and low with vegetables, stock, red wine and herbs. This process renders the meat fork-tender and deeply flavorful. For the plating, the beef is placed on a base of creamy polenta that was enhanced with asiago, Parmesan and Romano cheeses. Brussels sprout leaves provide accent to the beef and polenta, and the dish is finished with a red wine reduction and a drizzle of basil oil around the plate. If there is a plate that defines comfort food, this is it. This dish is a feast for the eyes and one that satisfies the soul. Our next entree was pan-seared grouper served alongside a paella risotto with assorted shellfish. The risotto was cooked perfectly and contained fresh shrimp, clams, mussels and chorizo cooked in a saffron broth. The grouper filets were tender, juicy, and were topped with a green herb mixture containing cilantro and minced jalapeno. The mild flavor of the seafood and chorizo was brought to life with the addition of the fresh herbs and jalapeno. A very light and satisfying dish. The remaining entree featured homemade ricotta gnocchi. This plate contained generous pillows of dough served in a sauce made from a mix of heirloom tomatoes, bacon, arugula and shaved Parmesan cheese. At first glance, the gnocchi appeared huge, which might lead you to believe they would be tough. After the first bite we realized this was not the case. They were light with the flavor of the ricotta. Mixed with the sweet tomatoes, smoky bacon and peppery arugula it made for a wonderful pasta course. As promised, following our feast, Chefs Delgarbino and Strollo sat with us to talk about the dining experience they hope to provide to their patrons. With respect to the menu at Leo’s, it changes four times a year along with the seasons. Admittedly there is a give-and-take between both chefs to balance presentation of new menu items with mainstay favorites such as veal and chicken Parmesan. They focus on using locally sourced fresh ingredients and build the dishes from scratch. Mark, in a moment of enlightenment, commented about how each dish is served complete. The chefs put thought into what starch should go with what protein. The result from our own sampling demonstrated this perfectly. It’s evident that they have a passion for what they do. In addition to the restaurant service, Leo’s provides catering for any type of special event. Chef Strollo remarked that these occasions give them an opportunity to showcase their creativity. The fall menu should be out in a couple of weeks. Although the menus and seasons change, you can always count on fresh, consistent, beautifully presented, well seasoned food. Whether it’s a classic Italian dish or an innovative seasonal entree, you can never go wrong at Leo’s. Mike and Mark are on the lookout for the biggest, hottest and tastiest dishes in the Valley. Email them at BrothersInFood@gmail.com.